There’s nothing lovelier than seeing dogs flying around the common, finding their inner wolf, running after that ball as if it was an escaping antelope. – Keeping your dog under control, by either commands or a lead. – Picking up your Dogs poop – The fixed penalty notice is for £50 [but if prosecuted in court for dog fouling you could receive a maximum fine of £1,000]. Most dog walkers on the common follow the rules. There are also unspoken rules, just etiquette that keeps all of us and our pups safe. One of those rules is that you know exactly what your dog is doing, and that its behaving appropriately. This becomes a problem when technology gets in the way. Mobile phones. They are a necessity – but are they necessary when taking your dog for a walk? The answer is “Not really”. Taking your dog for a walk isn’t just about exercise, although it is very important – its also about bonding as a pack. Dogs look to us for guidance, and if we have our heads buried in a screen, they don’t get that. If they aren’t getting guidance, then they decide for both of you – that they will take control. Its pack nature. It’s also dangerous. dogs wander off – bored. So they make their own fun. This means running over to other dogs on the Common. However, this isn’t always welcome, either by the dog who is being approached or the owner. Recently I saw a dog dawdle dangerously close to the road, and was just about to run on to it, until a passer by managed to grab it. The owner still blissfully unaware of its dogs near death experience, too busy checking life or death info on the screen. Yesterday a very friendly Lurcher wanted to say hello to my anxious dog [on a lead] and no amount of shouting was able to get the owners attention, who was having a fabulous conversation on her phone quite some way off. Fortunately Mr Lurcher had the good manners to stop when I shouted very assertively to him to ‘stay’ and eventually went on his way. Refresh your memory on how we interact with other dogs. Take a moment to look at the Space Etiquette for Dogs poster [left]. It really does make sense. 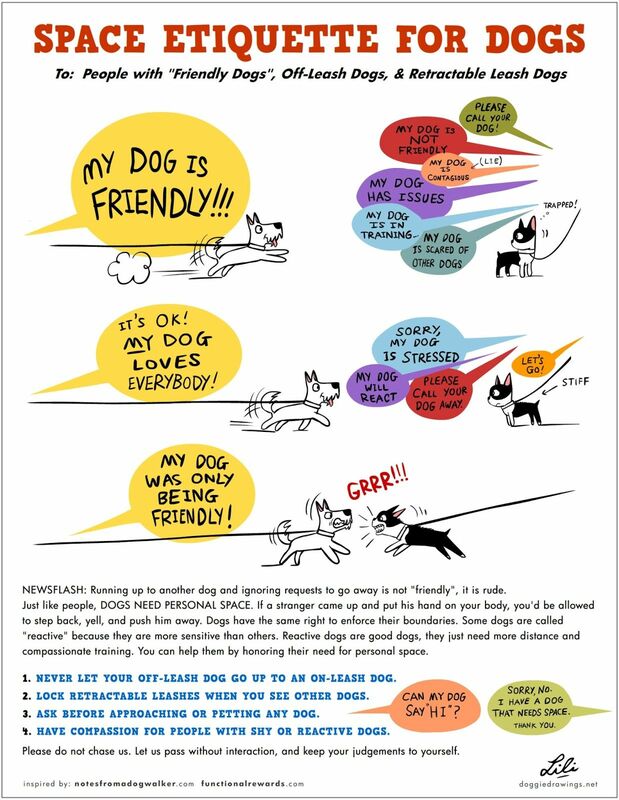 Even if you have a brilliantly chummy dog, remember, other dogs may be on leashes for many different reasons. Please respect their boundaries and their owners requests – there is usually a good reason for it, and will keep your dog safe also. More scarily though, there are people specifically stealing dogs. No reports on the Common as yet, but there are reports lately from nearby Brockwell Park & Dulwich Park where distraction crimes have seen owners have attempted thefts of their dogs. Very recently in Black Park [nr Slough] where a dog was happily trouncing around, disappeared. After an hour he reappeared, accompanied by strangers. The owner, on her own in a deserted car park with these criminals was threatened that if she didn’t pay, the dog was going in the back of the van. They wanted a £1000, they got £100. 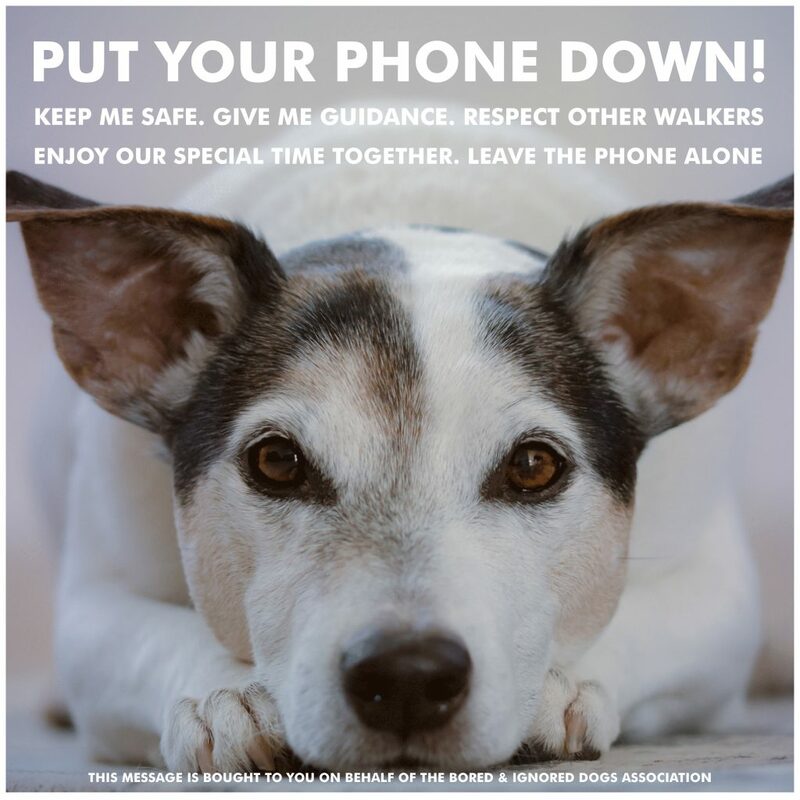 Don’t lose sight of your pets and be aware of your surroundings, you dont want to make yourself a target for phone thieves either. The bottom line is, dogs need communication, and your walk is mostly what keeps them on track with you. Enjoy your walk. Enjoy the space, the sky, the trees with your dog. Reports tell us they get depressed. I don’t doubt it. Many a time, I have passed a human statue, focused on the white screen while their dog awaits instructions, or just a bit of interaction. Our days are crammed with incoming information – you can look at your phone 23 hours of the day. Give your dog that one hour of undivided attention. You will both enjoy it more. If you have a repeat offender on not picking up their dog poop – you can report it. Not clearing up is an environmental crime. The Streatham Common Furry Clan: Members will often recognise a dog if you have a photo of it, a very useful group to share information with [you have to be a member and have a dog]. They might be able to give you good advice if you are really stuck! If you have time – maybe check DogLost to see if it has been reported there.